Don't get me wrong, I'm a huge admirer of Costco co-founder and former CEO Jim Sinegal, who rebuked his board of directors when they told him he could pay his workers less and his shareholders more. According to the New York Times, Mister Sinegal said, "Good wages and benefits are why Costco has extremely low rates of turnover and theft by employees...This is not altruistic. This is good business." In addition, Costco's automobile program means that there's no haggling: the dealer must show you what they paid wholesale for the car and then can only add a 2% profit. I used Costco to buy my Honda and it was stress-free. And finally, Costco is the largest grocer of organic foods in America, which is extremely impressive. However, as more and more people live alone in America, Costco's bulk and "family" sizes no longer make sense. I physically cannot eat 12 mangos before they spoil; I do not have room to store 30 pounds of rice, 12 pounds of almonds, 5 pounds of hummus, a vat of oil, 60 yogurts, or 24 rolls of paper towels. As more and more people live alone, I can even eventually envision a lawsuit claiming that Costco discriminates again single people. Similarly, there is no express check-out lane and it always seems that there are 8 restauranteurs stocking up their weekly supplies when I'm trying to pay for my 12 mangos, 60 AA batteries, and enough band-aids and vitamin C to survive the apocalypse. Lastly - and I am not a psychotherapist who easily doles out diagnoses - but I'm fairly certain that my PTSD was at least AGGRAVATED by my last few experiences in the Costco parking lot. If you have ever been there, you know what I'm talking about: you wait ten minutes for a soccer mom to load up her van only to find out that now the 5 kids are headed back for .65 cent ice creams. Thrive Market's mission is to make high-quality, healthy food affordable and accessible to every family in America. This online grocer offers all of the non-GMO foods and healthy products you love at 25-50% below retail prices and shipped right to your front door absolutely free for orders over $49. Wow... my day-long excursion to Costco was just transformed into 8 minutes on the Internet! Magic. And I don't have to buy in bulk. Amazing. I can find everything I need on Thrive - non-GMO foods, snacks, vitamins, supplements, personal care products, eco-friendly cleaning supplies, safe and nontoxic beauty products, kitchen staples, homegoods, organic baby food, kids products and much, much more. But what I like best is that I can filter my choices by dietary preferences - Paleo, gluten-free, raw, or vegan. Very cool. And the company's "Thrive Gives" initiative also makes it possible for food-insecure families to access natural, organic, and non-GMO foods and products for the first time. For every Thrive Market membership purchased, they sponsor a free membership for a family in need. Awesome. In a country where inexpensive, processed food is cheap and ubiquitous, it can be difficult to make healthy choices. The issue isn't just about having enough food, it's about having access to healthy foods. In fact, more than 23 million Americans live in "food deserts" - neighborhoods where purchasing whole foods isn't even an option. 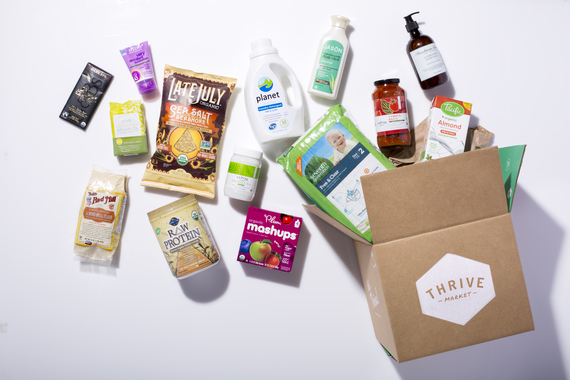 Thrive Market offers wholesome products at wholesale prices. Literally anyone can buy best-selling health and wellness items at up to 50% regular retail prices. And if you click HERE you can try it for a month for free plus get 20% off your first purchase. For me, Thrive Market is the best thing since sliced (gluten-free) bread!